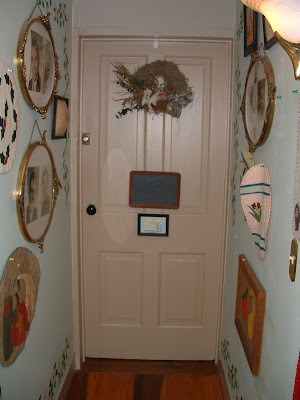 In recent weeks, we have had several potential guests calling for more information and explanation of how our Mason/Dixon Suite is laid out so I thought it might be a good idea to give more details on a blog post. The Suite received it’s name from a neighbor who, after she saw the Confederate and Union Rooms, just popped out with the Mason/Dixon name! 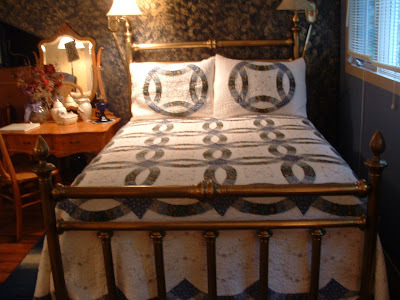 We thank her as this name has fit nicely with the layout and theme of the B & B. 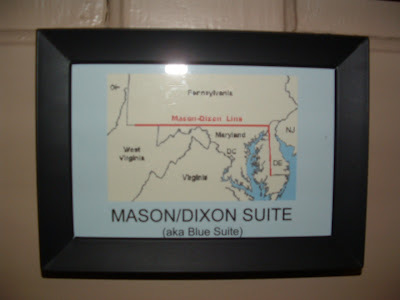 The Mason Dixon Line was a name used to acknowledge a separation of the north and the south during the Civil War. At the B & B it doesn’t actually separate our Union and Confederate Rooms but it does run the entire width of the house and comprises two separate rooms. The entire living space that guests will have is approximately 550 square feet with a view out of 20 casement windows! On the northern side of the room the view is of the pool and gardens and on the southern side your view will be of the treetops, the driveway and the wildflower garden. On this side also in the spring there is a fantastic view of the flowering magnolia tree where you can almost reach out and touch the petals! I would take a picture of this beautiful tree but it will have to wait until spring arrives! At that time I will post an addendum to this post with that picture so do come back! 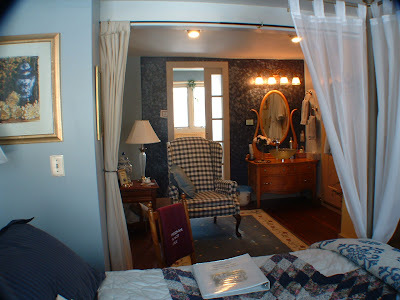 The first room of the Suite houses a queen canopy bed, antique furniture, a satellite TV in a corner cupboard, a mini refrigerator in the closet, a leather like swivel chair and a very comfortable wing back chair. In the corner of the room we have placed the antique dresser plumbed with an above bowl sink. whirlpool tub, the toilet, and the free standing shower. 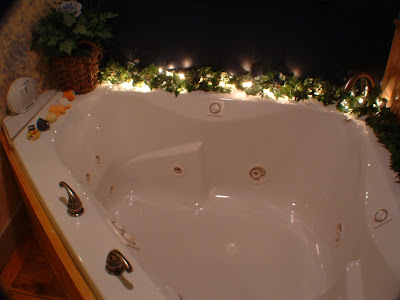 For those romantic occasions, the Jacuzzi tub is surrounded by mini lights hidden in green ivy. 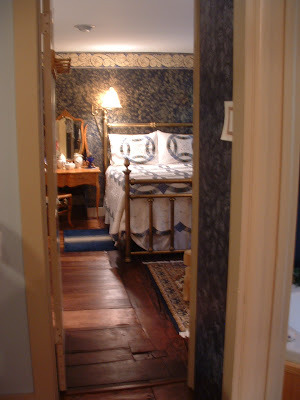 Moving through the door and into the connecting room, you will enter a space that is so large that it houses a queen bed, a full bed, a sitting area, a desk area, and a reading area! 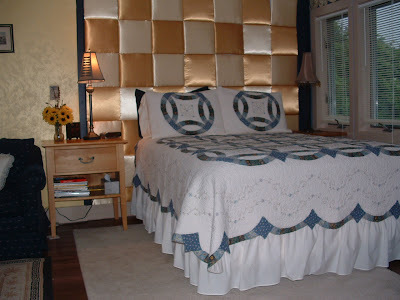 On the opposite side of the room with a garden and pool view, is located the queen bed with a checkerboard patterned padded wall used as a headboard. 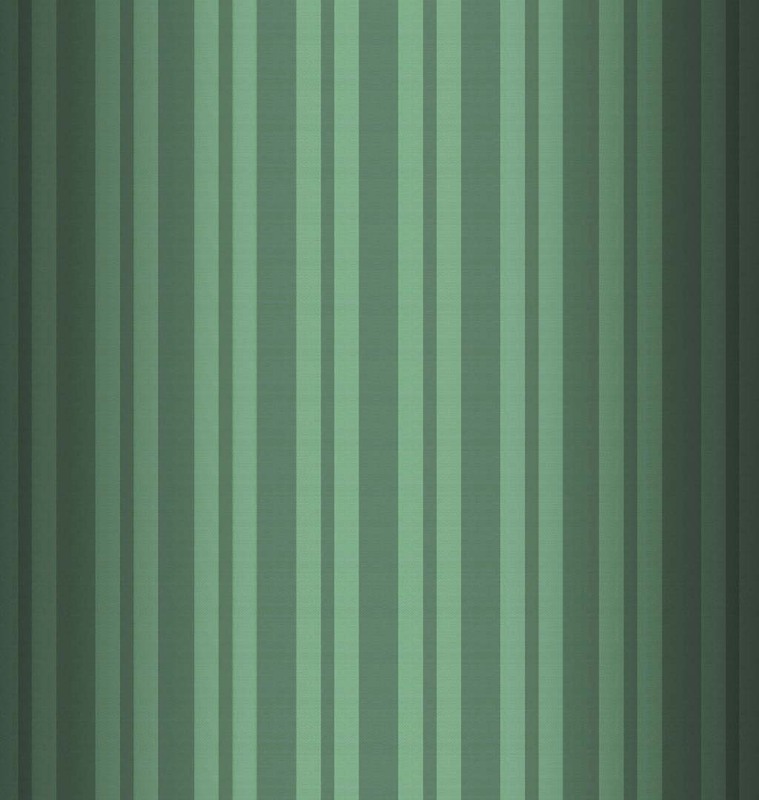 Tall lights allow reading on both sides of the bed. 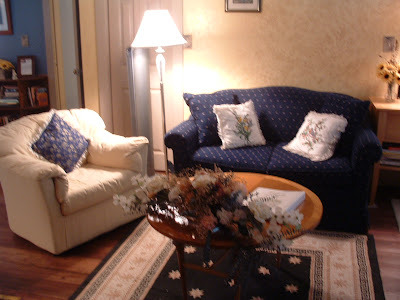 The conversational sitting area is in the middle of the room separating the two beds. The sofa converts to a single sofa bed for either a 4th or 7th person. From this area, one can converse, read, or watch the satellite TV. And the room is still large enough to have a bookcase full of antique and modern books with another lounge chair to relax in while reading or move it over to expand the conversational area. Sitting at the antique desk, a guest can look out over the pool and garden while working at a wireless computer or doing other business. Because each room has a closet, there is plenty of room for hanging up clothes or storing luggage. Or slide the luggage under the bed. Who wants to trip over suitcases when you’re trying to relax! And the tour of the Mason/Dixon Suite comes to an end. We hope you enjoyed it and can get a better visualization of the space that will be yours when you book accommodations for yourself and friends or family in what is also known as ‘The Blue Suite!’ We are looking forward to your visit. Give us a call. You won’t be disappointed!